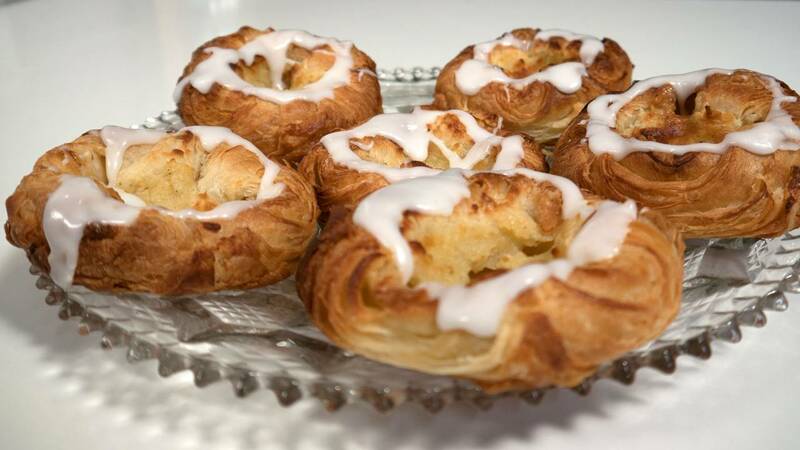 Video Recipe - My favorite cake when it comes to danish pastry is the "Spandauer", or as they are known abroad "A Danish". This is how you can make them at home. Make the pastry cream and let it cool while you make the rest. Roll the dough into a 16" x 16" (40 cm x 40 cm) square with a thickness of approximately 1/4" (½ cm). The dough should be cut into 16 equal square pieces. Cut it into 4 strips on each side by cutting it in half and then split those two pieces in half again. Do the same from the other side until you have 16 pieces. Put a dollop of remonce at the center of each piece. About 1 teaspoon full. Press the corners over the remonce. Use the remonce as "glue". Press the corners firmly down against the bottom. Beat eggs and cream together for the egg wash. Brush the edges of the cakes with egg wash until they are shiny but not too wet. Let them rise until doubled in size, about ½ -1 hour. The dough must not became so hot that the butter melts. So in a hot kitchen you might need to use the fridge to cool it down once in a while. After rising, press the corners of the cakes down into the center again. 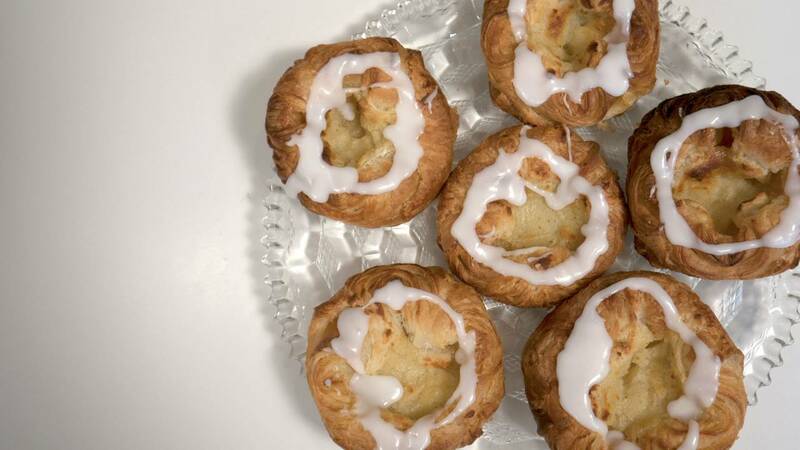 They usually loosen a little during proofing and will "blossom up" during baking if they are not secured again. Put about a topped tbsp of cream or jam in the middle of the cake. Sprinkle a bit of hazelnut flakes and/or a little sugar on the rim. Convection oven: bake at 356°F (180° C) for 25-30 minutes. Normal oven: bake at 390°F (200° C) for 25-30 minutes. Combine the icing sugar and water to make the icing. Let the cakes cool for at least 20 minutes before icing them. We made these tonight, and they are very good! We made a lemon cream cheese filling, and topped them with raspberry jam. Fun and messy to make! Thank you so much for your information on how to make these pasties. My Grandfather who long since has passed learned the trade of a baker as a young man. He was from Odence Denmark and came to America when he was 18 or 19. He was the head baker at the Hotel Utah till he retired. Many of the family had tried to get recipes from him but I think he was just not wanting to think how to translate them into smaller amounts for home use. Not sure though. We did get some of the recipes but no instructions. Thank you, thank you, thank you for the instructions. We are having a big family reunion and I will be making some of the Pastries. I wanted to freeze them and bake the day of the reunion. My question is: When taking them from the freezer to the oven is the temperature and baking time different than from above instructions? You have 390* for 20 min. would that be different for frozen Pastries?